There are many spellings of the AMIS name, including AMIES, AMISS, AMES and AMYES. It is thought to have originated from the French word "ami" for a friend. 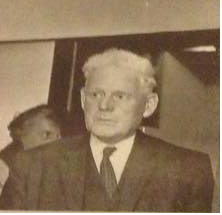 Arthur AMIS (1907 - 2000) was a well-known Trunch resident, living in the village all his life, working on farms and taking an active part in village life, the Methodist Church and local politics. He also wrote the book "From Dawn to Dusk" about his memories of the village. He lived in the old School House in Back Street and his garden contained the remains of the school that he had attended many years before. Arthur's father was Arthur Edward AMIS (1881 - 1959) who was born in Norwich but moved to Trunch with his family and married a Trunch girl. His grandfather was Richard AMIES (1843 - 1927) who was born in Cromer but moved to Norwich and then Trunch. He worked as a soldier, shopkeeper and publican. 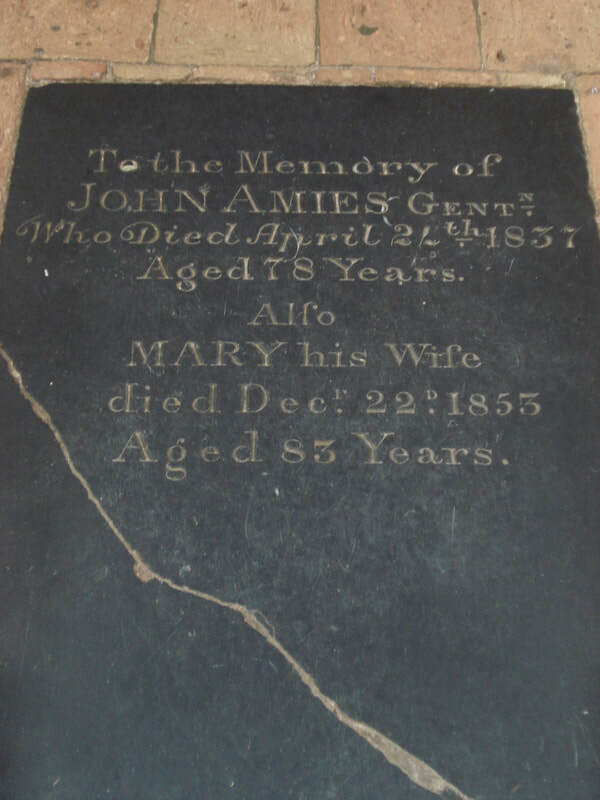 Richard's father was John Henry AMIES (1815 - ?) from Cromer and his brother was George Burton Amiss who ran the New Inn in Trunch at one time. Before them was Henry AMES (1791 - 1856) from Tunstead and his father and grandfather who were both Samuels also from Tunstead. As well as the family line above there were other Amies families in Trunch in the 19th. Century, who were more prosperous. John AMIES (1759-1837) is on the polls (voting list) for 1806 as a yeoman of Trunch and he is shown as paying land taxes here from 1827-1832. The tithe map of 1839 shows that his son John owned Brick Kiln Farm and a lot of land in the village although at that time he was farming in Frettenham and and renting out his Trunch property. The older John and his wife Mary have the memorial in Trunch church which is shown on the right. William AMIES (1806 or 10?- 1889) also lived in Trunch and was a brewer and may have been one of the same family, although his birth is not in the Trunch records, he always gave it as that in the census and there is an 1859 will of a William Amiss to investigate in the Record Office. It seemed likely to me that these two branches of the family were linked in the past and although I have not found definitive proof yet, both branches trace their ancestors back to the village of Tunstead in Norfolk, so it is certainly possible. There are also several people in the Trunch records who call themselves AMIS alias WORTLEY and this seems to have been started by the illegitimate children of Deborah Amis and her uncle Samuel Wortley, who she later married. Click here for census details and a family tree for the 2 branches.